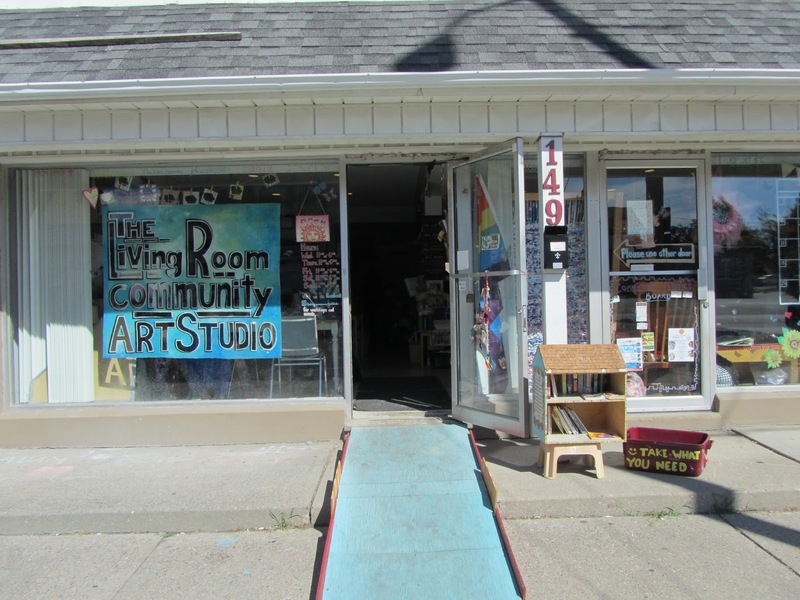 This is attempt number four in trying to write about the LivingRoom Community Art Studio. It’s difficult to put into words what this place is doing for the community. For such a tiny place, it does big things. Thus, I’m going to keep it simple. I’ll let the Studio speak for itself. 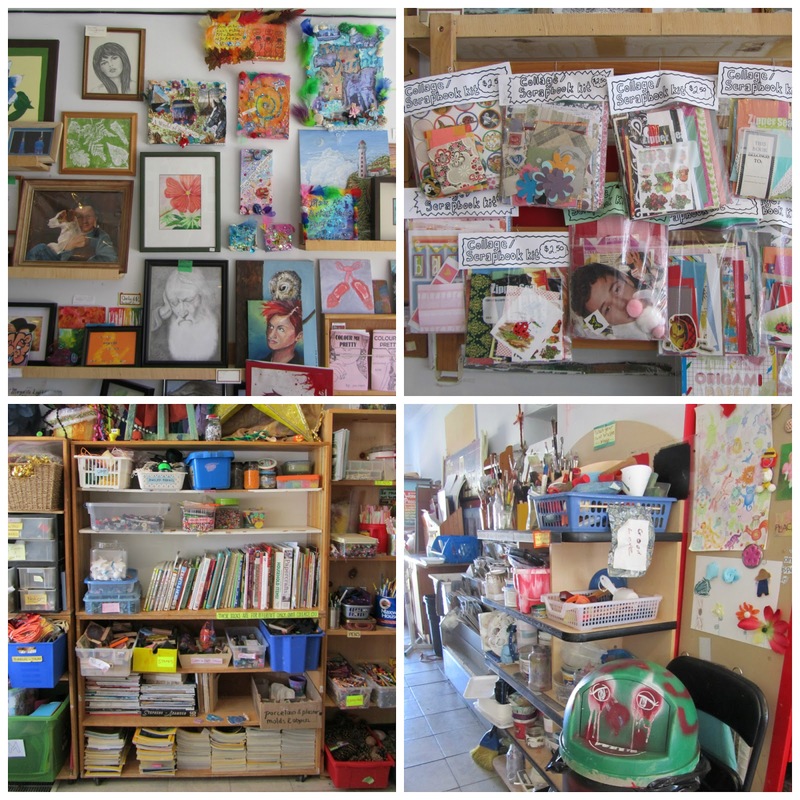 In Oshawa, Ontario, there’s a place where you can make art for free. No strings attached. Yes, it’s actually free. No, it’s not only for children. Anyone and everyone can just walk in and make art. There’s all the supplies you’d need. If not, there’s all the supplies to make it work. I don’t mean someone micromanaging or telling you how to make art. I legit mean you can walk in, grab supplies, sit at a table, and make whatever. Today I made bat mobile thingy, a moon phase wall hanging, and something to pin pictures to (out of drift wood), and spray painted a tin box I was having problems with at home. Best thing about paint – paint over it to start over. Inside the LivingRoom Studio you’ll see the walls lined with all manner of art and craft supplies. Local and distant artists have their work on display. Music is usually playing, but on a busy day the melodies are just background noise to the sounds of art happening. Strangers become friends. Friends get to know each other better. Neighbors exchange more than just “hello” for the first time, and there’s no rush to leave, like at a coffee shop. Making art also releases the nervousness in social interaction, as you have something to keep your hands and mind busy. People come in just to say “hi” or drop off donations. You could worry that they’ll run out of supplies…but oh, no! They have so much from all the kind people donating their extra supplies or things they don’t want anymore. The space is full. 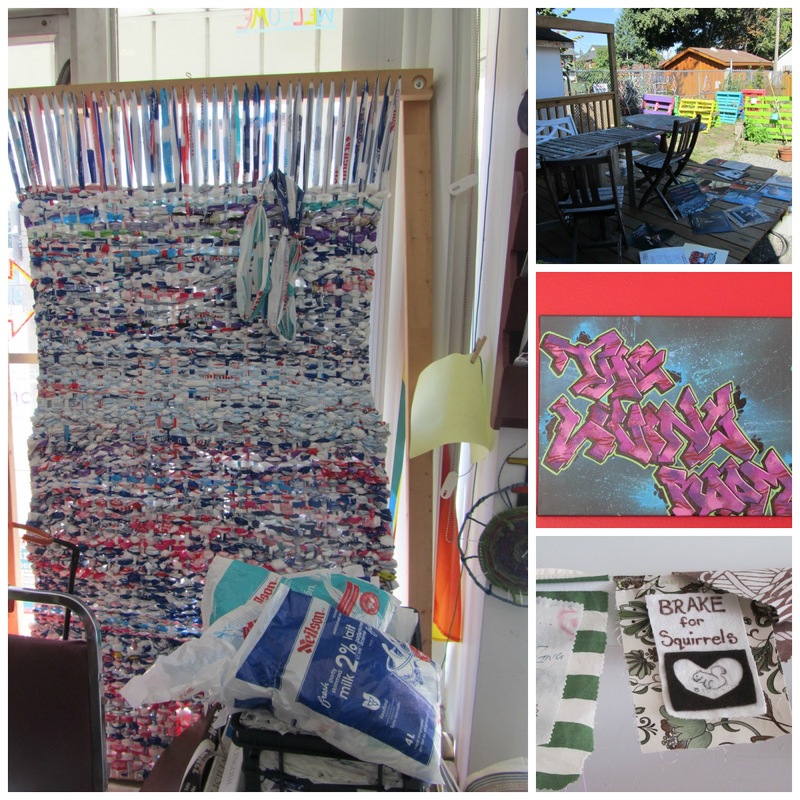 Why a Community Art Studio? Many communities, in the US and apparently Canada, lack resources for the creative side of life. Even the education system has failed in many places to provide study in the arts. Society (for reasons we could write books about) decided that the arts are not important and cut funding. Art is becoming for the elite – this is not okay. What about the artist that can’t afford supplies? What about the inner artist in all of us? What about a place for community members to meet, share, brainstorm, and make things happen together? The LivingRoom hasn’t even seen it’s full potential yet. We need more places like this. I shouldn’t have to explain why art and a creative space is important. Take away art, music, dance, poetry, literature, and other such things from a society and what’s left? A skeleton of basic human behavior. Art is the voice of a culture. The patio, some art, and squirrels. What You Can Do in the LivingRoom Community? The LGBTQ + community is welcome there and they try their best to be a supportive place for all artists. Plus, everyone is an artist. CONTRIBUTE to the well-being and stability of our community by providing a working model of a non-institutional community art setting that sustains and improves community mental health and social capital. ESTABLISH a safe, non-judgemental space where people from all walks of life can come to make meaning of their experiences and connect with others through constructive, arts based activities. PROMOTE positive Self Identities and BUILD Self-Esteem through acknowledging and celebrating the uniqueness of every individual and their creative accomplishments, reinforcing the value of their work through positive feedback and public exhibitions. ENHANCE the lives of those members of our community who feel most marginalized by providing them with a place where they can be defined as creators and artists, and not by the challenges they may regularly face. STRENGTHEN relationships between community members and organizations by bringing together people who might not otherwise interact, to talk and make art about what matters to them, and to learn about one another and the worlds in which they live. INSPIRE community driven action through providing people with opportunities to contribute to and collaborate on group art projects and exhibits that acknowledge, examine and address the issues and themes that impact them and their Communities. EMPOWER community members through highlighting skills and knowledge they already possess by providing manageable ways of transmitting those resources to others through workshops, skill shares and studio mentoring. PROVIDE income to local community members through providing them with regular opportunities to exhibit and sell their artwork and handicraft to the public. ENCOURAGE social equity and inclusivity by making the arts accessible for everyone and providing individuals and families who may not have regular access to arts activities and events with regular and ongoing opportunities to participate for free. INCREASE cultural vitality through engaging community members in arts activities and community events that broaden their understanding of what art is, and who artists are. Moon art, bats, and drift wood display.